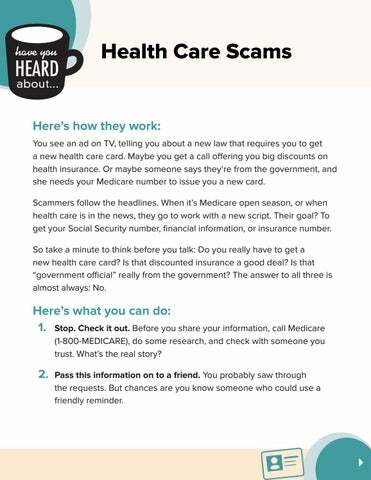 Health Care Scams Here’s how they work: You see an ad on TV, telling you about a new law that requires you to get a new health care card. Maybe you get a call offering you big discounts on health insurance. Or maybe someone says they’re from the government, and she needs your Medicare number to issue you a new card. Scammers follow the headlines. When it’s Medicare open season, or when health care is in the news, they go to work with a new script. Their goal? To get your Social Security number, financial information, or insurance number. So take a minute to think before you talk: Do you really have to get a new health care card? Is that discounted insurance a good deal? Is that “government official” really from the government? The answer to all three is almost always: No. Here’s what you can do: 1. Stop. Check it out. 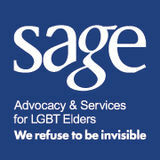 Before you share your information, call Medicare (1-800-MEDICARE), do some research, and check with someone you trust. What’s the real story? 2. Pass this information on to a friend. You probably saw through the requests. But chances are you know someone who could use a friendly reminder. Please Report Scams If you spot a health care scam, please report it to the Federal Trade Commission. Your complaint can help protect other people. By filing a complaint, you can help the FTC’s investigators identify scam artists and stop them before they can access to a friend’s hard-earned money. It really makes a difference. Information from the Federal Trade Commission on Health Care Scams.